The Tournament Backdrop. Click the photo for bigger view. I have fond memory for this tournament because i have played 3-4 times during the 90's with University Putra Malaysia (UPM). If my memory serve me well, the first edition is open to all university in ASEAN countries and used the name Grand ASEAN Chess challange (GACC). Later years, the organiser open the tournament to Asian countries and changed the tournament name to Grand Asia Chess Challange . After showing great succes every year, they decide to open it to all University in the world. However the organiser still used the name GACC although the "A" is not relevent anymore because it's now open to all internationl university not ASEAN or Asia only. This is probably because for loyal followers of this tournament, GACC has been so well known that changing the name to something else like GICC would probably be quite "weird"
This year tournaments include participation from university from Iran, China, India, Philipines, Singapore and the host country Malaysia. 5 titles player played in the Open section. ( 2 GM, 1 IM, 1 FM and 1 WIM) lead by the top seed - GM Amir Bagheri (FIDE 2490) from Iran. Others title players is Iranian - GM Shojaat Ghane (2408) and IM Morteza Darban (2392), Indonesian - FM Andrean Susilodinata (2254) and Chinese - WIM Gong Qianyun . The host country were lead by NM Zarul Shazwan (2085), Rizal Ahmad Kamal , Chan Tze Wei ,Tan Ken Wei (1937), Lim Kwan Pin , Pok Wern Jian (2098) , Ahmad Fadzil Nayan and others. NM Zarul Shazwan (left) in round 6. He beat IM Darban Morteza in round 3 ! Thanks to Andrew Ooi for sponsoring the tournament official site which contains update, info and photos about this year tournament. Below are one of the "masterpiece" from the tournament. It's a game between the top seed GM Amir Bagheri against the Chinese WIM Gong Qianyun. 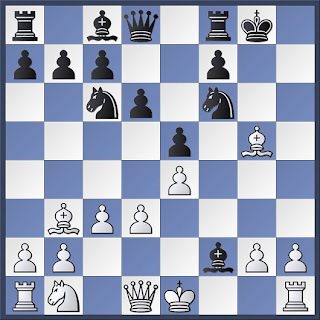 1.e4 e5 2.Nf3 Nc6 3.Bc4 Bc5 4.c3 Nf6 5.d3 0–0 6.Bg5 h6 7.Bh4 d6 8.Bb3 g5 9.Bg3 is the normal continuation and probably correct as it was suggest by the GM Killer - Mr Fritz 11 but Qianyun have different idea 9.Nxg5!? !